Alignment marks help to precisely arrange the impression. 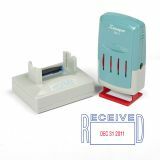 Xstamper ECO-GREEN VersaDater Message Dater, 2 1/8 x 1 5/16, RECEIVED, Blue/Red - VersaDater RECEIVED Impression Frame offers a fully pre-inked, eight-year message dater. Re-inkable stamp prints month, day and year. 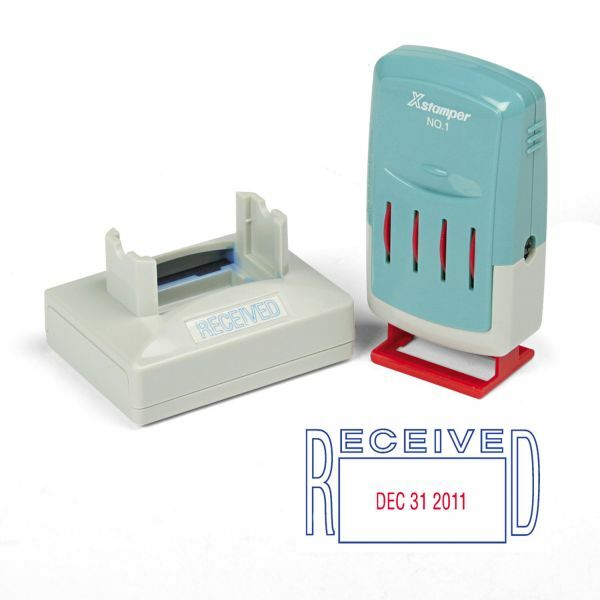 Easily convert to a line dater by removing Impression Frame and snapping onto the line dater frame. All Impression Frames print in blue, and the date prints in red. Impression size is 1-5/16 x 2-1/8". Stamp contains a high percentage of recycled material." Pre-inked, eight year dater is easy to use and delivers years of service.